Young people who are interested in a career involving computer games or comics have the opportunity to ask questions to industry experts at the 'Geek Festival'. The event that will combine stalls, exhibitions, workshops, a gaming zone and a Q + A session with special guests from within the industries. 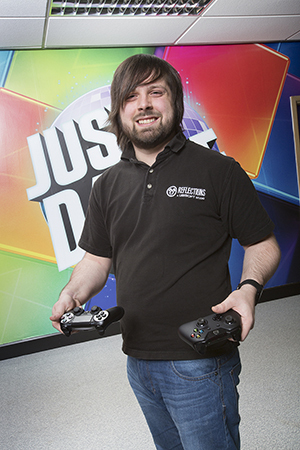 One of the guests will be Josh Heyde (pictured below), programmer for international software giants Ubisoft, who's based at the Reflections Studios in Newcastle. "When I was secondary school age I realised that I was interested in working with computers and I played a lot of computer games, but I never put the two together until I started looking at University courses. Then I ended up on a Games Programming degree course at Teesside University. I met a lot of people interested in the same thing and discovered the Reflections Studio in Newcastle and landed my dream job as a programmer. I'm responsible for the technical side of things. I take the ideas that the artists and designers have and make them a reality. When you get your hands on a game a programmer has touched every part of it to make sure it works - but yes, we are also responsible for the bugs!" 'Practice outside of what you do at school, college or university. Don't just do the work that you're given. It's passion that really gets you noticed, as well as having the ability. You can practice using online tools whenever you have free time. If you want to be a programmer you need to have a good understanding of maths and programming language as well as problem solving. Other guests on hand at the event include comic designer, Nigel Auchterlounie, who is responsible for Dennis the Menace in the Beano as well as his own published work. Steve Jackson Games famous for board games since the 70s, Games Workshop, Forbidden Planet and Travelling Man will also all have people there on the day to answer questions. The event is being co-hosted by regional event organisor, Steven Hesse and his brand Geek Apocalypse, which has a website and podcasts including interviews with guests including Red Dwarf's Robert Lewellyn and Chris Barrie, board game designers Matt Leacock and Andrew Hackard as well as promoting local North East talent. The Discovery School, which is being developed in conjunction with Newcastle College and is scheduled to open in September 2014, will bring brain games to test and develop mental agility - exploring the link between what are known as the STEM subjects; Science, Technology, Engineering and Maths and routes into gaming and other related industries. The 'Geek Festival' takes place between 1pm and 5.30pm at NE1's Space 2... in Newcastle.